We're in the back-to-school mode and while I'm thankful to be back in a routine, sometimes I feel the aches and pains of unmet expectations. Do you ever feel this way? You know, things like: I thought we'd get through more math this summer, or, how did we get so far behind in reading? When we start back with our hopes too high, sometimes we come crashing down when our expectations are not met. It can really be disheartening. If you've been reading through *most of the Bible in a year with us, you know that the Israelites have finally met their Promised Messiah, but many of them didn't recognize Him because He wasn't what they had been expecting. What's more, the result of their Savior's sacrifice didn't quite produce the salvation they had expected. The expectation of the early Church was to get out from under the thumb of the Romans, yet they grew through persecution. 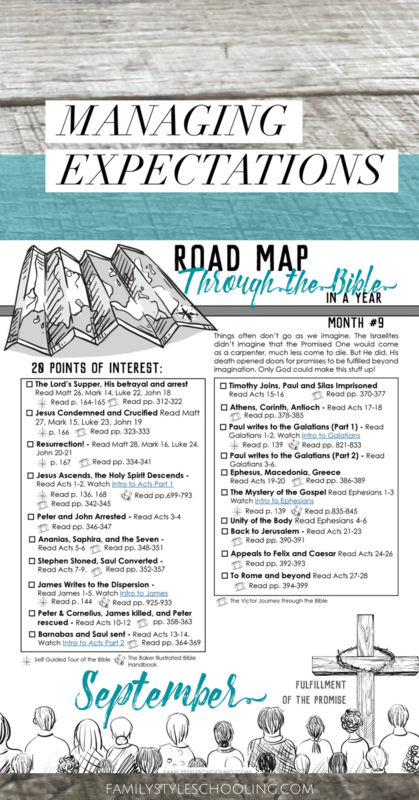 This month, as you read together, consider how our expectations can sometimes distract us from truly enjoying God's plan. Often what gets me in trouble is that I don't even realize that I expect something to go a certain way until it doesn't. Then I'm all worked up about how wrong it went. I expected one outcome and regardless of if the other outcome was better, it was different and therefore bad. Modern culture is pretty notorious for setting up expectations to be dashed. Think about the last Disney princess movie you've seen, or if you're like my family, a Hallmark Movie. While I really enjoy watching both of those, they don't portray reality. They build up young girls to expectations of romantic princes who come to sweep them off of their feet and live life happily ever after. But that's just not how it is. I was listening to music today while preparing food for my family and I was struck with an idea from a familiar song again. Suffering doesn't mean that things are going all wrong, or that if you just got your act together you would find smoother waters. The line that I love from this song is: "Your world's not falling apart it's falling into place." If you haven't heard Just Be Held by Casting Crowns, listen to it real quick. I can imagine that the Christians of the early church really felt like the world was falling apart. From our vantage point, we see the beauty and benefits of the suffering they encountered. Not a tear was wasted. God's economy doesn't work like the world's. The truth is that God's Word tells us that God isn't a let down. It's actually far from the truth. 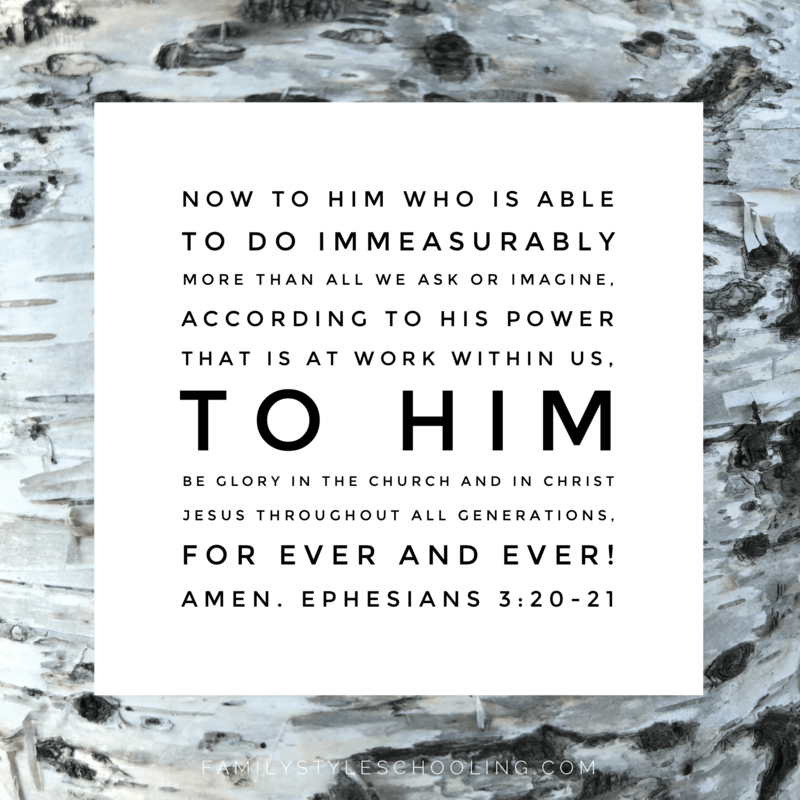 Ephesians 3:20-21 says that God is able to do immeasurably more than we ask or imagine. He can exceed our expectations if we allow Him to show us His way. As we start to look to what life really looks like walking with our Savior, we have to assess our expectations. If we pursue Him so that we'll find health, comfort, and safety, we might be disappointed. We're promised trouble in this world, but we're not without hope. God's economy is so much richer than anything this world has to offer. Celebrate the richness of a relationship with Him, and you will find that exceedingly abundant life here on earth. Beautifully said, Betsy! Thank you for sharing this guidepost with us. Blessings on the start of another new school year!